Melaka (Malacca) preserves the historic meeting of Chinese and European cultures. Initially, its strategic position on the Straits of Melaka encouraged a tide of trade with China, India, Siam and Indonesia. Later, colonial powers wrestled for control of the fascinating seaside city, and much of the 16th century Portuguese influence is cemented in its architecture. Visitors can expect an authentic cultural experience in this predominantly Chinese region, where open-air markets and traditional merchants are commonplace. 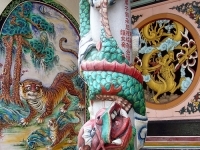 Melaka is also home to a unique ethnic group called the Baba-Nyonya. Born of Chinese and Malay ancestors, their remarkable lifestyle is recorded in the Baba-Nyonya Heritage Museum. Travellers should stop on Jonker Street too. The attractive thoroughfare is almost always strung with traditional Chinese lanterns, and hosts night bazaars and festivities on weekends. Otherwise, trips on the Malacca River are popular and feature many historic buildings, such as the Stadthuys. Once the Dutch administration's seat, it now houses a history museum. Travellers will also find some interesting ruins on St. Paul's Hill.